Most of the people often confront issues regarding the speed of Android phones. Generally, Android devices have the tendency of getting antique not only in terms of appearance but also becomes very old due to long-term usage which in turn affects the performance. This might sometimes lead you to upgrade your smartphone very sooner than you expect. Ultimately, all these issues makes your Android smartphone slow down in a drastic manner. Whenever you tap on the home button on your Android handset, it takes much time to switch to the new task or back to the desktop. Sometimes, it happens that, when your device has become extremely slow, the text you type on the screen will display after two or three seconds. You might be searching vigorously to spot solution for this slow down problem. Well, you have landed in the right place to overcome this problem with your Android smartphone. Here are 8 ways given in detailed that helps you to speed up your Android phone. Without much introduction, let us get into the simple ways to speed up your Android phone. Here we are presenting you eight simple and ways in a detailed manner that assists you to speed up your Android smartphone. You can use the following ways to boost up your android phone and complete your tasks in a faster way. Check out all the ways and try to apply these ways on your Android device if it is troubling you much. Most of the people always download numerous applications on their android smartphone without even thinking about the storage space. It doesn’t slow down if your device has lot of sufficient storage space, but if you run out of space then it is must to delete or disable unwanted apps from your device. Initially, go to the device settings. In settings, you can see list of options. Click on ‘Apps’. Now, you will get all the apps which have been downloaded on your device. You need to select any of the unwanted apps from the huge list. After selecting any app, it displays the app info and also displays Force Stop and Uninstall options. 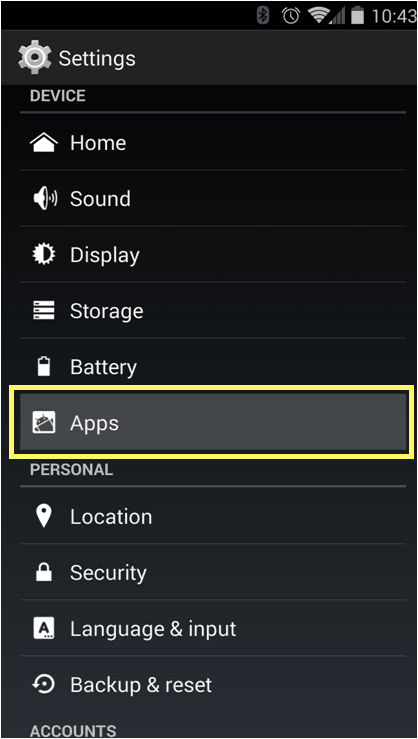 You need to click on Uninstall so as to delete that app permanently from the list of apps on your device. This way you can uninstall all other unnecessary apps on your android device that can speed up your android smartphone. Later again if you wish to have that app on your phone, then you can easily download it. It is very common that you store numerous music, video and other files on your phone. By filling up your device storage with massive things, then it will definitely affect the device’s performance. Sometimes, you might have downloaded different files and all those will create a hell of mess. So, always try to keep your phone memory as clean as possible. Remove all the junk files stored in your device storage. Take a look over all the files in your phone storage and delete unnecessary things that occupy much space. Just tap it and you’ll then see a huge list of miscellaneous files that applications have generated on your device storage. Go through the list and if you find something which is of no use, you can delete it by selecting the unwanted files and if you have no idea about any file, leave it without deleting. Do you know about cache data? Well, it is usually a good thing that stores some things in your device’s local storage. It speeds up your device by saving the data so that it reduces the loading time of the system and avoids the necessity to wait for the Internet every time you search for a website or app. Now, the actual problem is that cached data can be buggy sometimes that makes all your apps to misbehave. 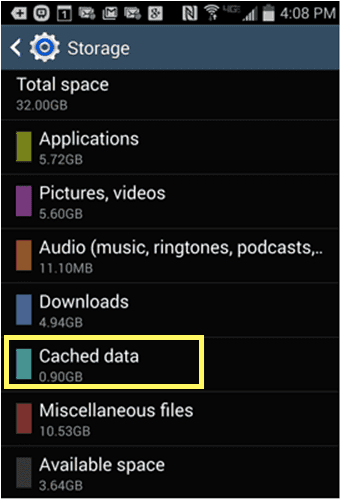 All the cache data will build up and become pretty large on your device’s internal storage. So, try to clear all that cache data from time to time. 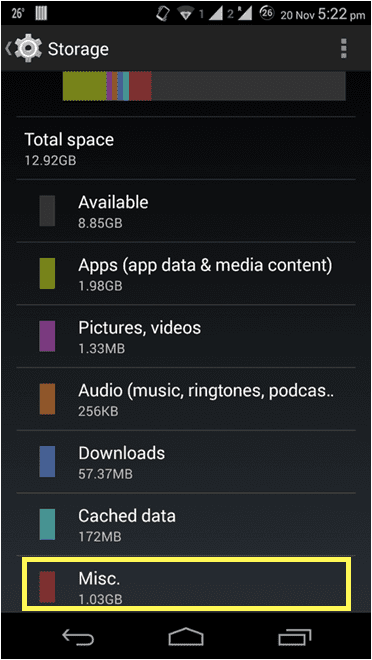 You can clear the cache data for an individual app directly from the application manager or you can look for a cache cleaning application which is available in the Google Play Store. Go to Device Storage page and then scroll down the list. Tap on Cached data entry from the list of options. Then, you can see a pop-up asking that you’re able to clear out all cached data. Click OK so that it clears all your cache data. You can clear the entire cache data as shown in the above images. If you need an app which is important, then it can be re-cached the next time when you open the app. You can also use App Cache Cleaner, which will automatically purge your cache automatically on a regular schedule. All Android devices may not have an SD card, but if you have then a messy slow Security Digital card can make your device even more slower. In order to fix this issue, all you need to do is to back up your SD card and format it so as to speed up your Android phone. For this process, you need to have a computer in order to store the backup files. 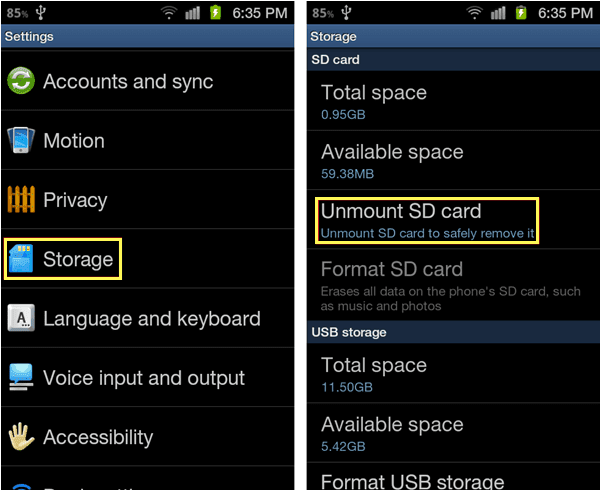 Power down your Android and take out the SD card from your device. Place it in a USB and connect it to your computer that takes few seconds to mount. Create a new folder and copy all the files from the SD card and paste them into the new folder. Once you have finished copying, take out the SD card and place it back into your phone. 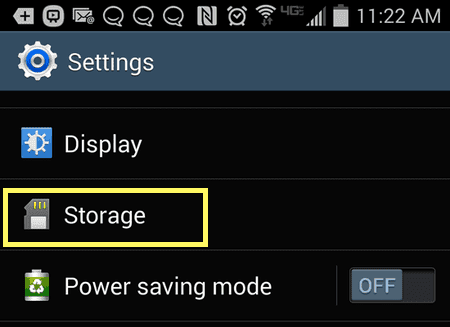 Go to Storage in Settings and then format the SD card so that it wipes off all the data. Once the card is formatted, switch on your mobile phone. Note: By formatting SD card, you can lose game progress, app data and other things. Make sure you are ready to lose it then go ahead with the format option. Widgets are pretty cool and looks splendid, but actually they can be huge resource hogs that eventually slow down your android device. They constantly fetches data and try for more updates. So, limit the usage of widget so as to speed up your phone. You need not completely relinquish using widgets, but try to confine the usage.It is true that Widgets are the most useful and coolest things offered by the Android OS. 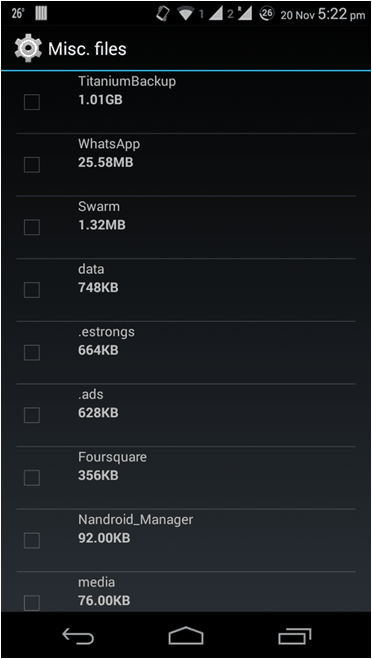 Jut try to limit the widget usage to some extent so that your android device will speed up. When you have a smartphone which has become very slow, then the reason for the slowness is due your RAM in your phone. The Random Access memory is the place where your device stores everything and so due to huge memory on RAM, your device may become slow. To speed it up, you need to free up RAM that eventually increases the performance of your device. 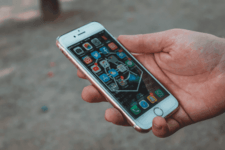 You may have a habit of Multi-tasking several apps that switches you between different tools, but this might affect the performance. To avoid this, you need to close all the apps and free up the RAM. Close all the apps that you no longer use by switching to running apps list. Press and hold the home key and then close the apps that you want to exit. Just tap the pie chart button located at the lower left of the screen and then move to the RAM section. Tap the Clear memory button. This will close all the background processes that are running unnecessarily on your device. This way you can free up your RAM and speed up your Android device. Rooting of an Android device allows the users to get access to run high-end applications and get complete control over the smart device. Rooting of Android device allows the users to unlock the pre-defined OS and replace the firmware with the user’s desired firmware and makes the job of customization of the smart device more easy and convenient. By rooting your device, it can speed up your android smartphone by allowing your phone to run in a smooth way. 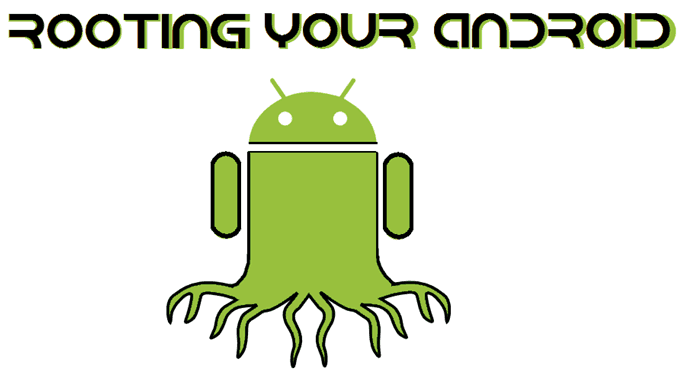 Here is a complete tutorial that guides you how to root Android smartphone easily. Before rooting your device, be careful and follow the step-by-step instructions. When all the above methods fail to speed up your Android device, the final way is to perform a factory data reset. Well, do you know what actually is factory reset? It is a pretty good method to wipe your phone in a clean way and leave the software just like a new handset by giving it a clean start from time to time. Remember, this will delete entire data on your phone, so it is recommended to back up any of your important files before factory reset. But, Factory Reset takes pretty much time, however, it is a good idea if your phone has become drastically very slow. You’ll find an option to reset your phone in the device settings under Backup and reset. 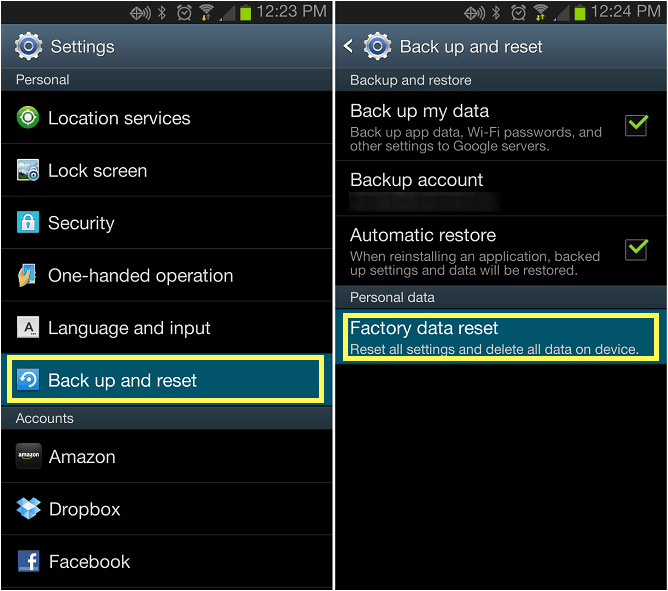 Tap Backup and Reset that directs you to Backup and Restore page where you can find Factory Data Reset option. Click on the checkbox of Backup my data and Automatic Restore. Now, Tap Factory Data Reset to start the backup and reset process. This way you can swipe complete data from your phone and now you can use it as a brand new device in a faster way. Factory Reset can speed up your Android device and increases the performance of your device. These are the 8 ways to speed up your Android smartphone. Follow any of the above given methods if you feel that your device has become very slow. Hope this tutorial helps you in the best way to speed up your Android device and increases the performance of your phone. Its a great post. You made this process so easy with the efforts of screenshots. I will try rooting of my android!